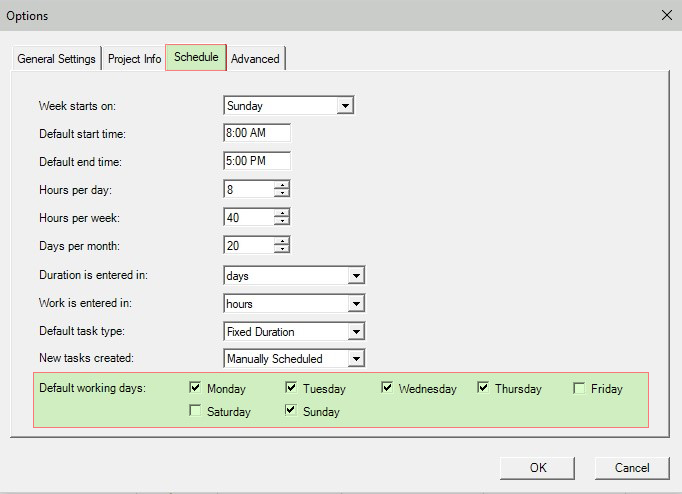 When scheduling a project in either Microsoft Project or Project Plan 365, you can change the calendar for your project, i.e. the days your work is ongoing – or not! In fact, you can tailor calendars in many ways, for example, you can have unique calendars for people (resources), for tasks and for the project as a whole. Having all these custom calendaring options is great, but can be a bit complex and confusing to set up (see here). What if all you need to do is change the days of the week everyone is working, for example if your project locale is somewhere Friday & Saturday is considered weekend time off (or, if you are lucky enough to just work 4 days a week instead of 5)? In these simple cases, the latest version of Project Plan 365 provides a much easier way to change your project calendar. And what if you just want to extend the default work week (M-F) by one day, perhaps to finish up some work left over from Friday, using Saturday to get that done. 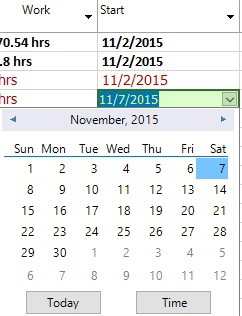 Here too, Project Plan 365 provides a quick way to change the project calendar to reflect that one extra day of work. A default work week, for example, used in most Muslim-oriented countries. In the example above, we’ve changed the default work week, and have also updated the default project calendar all in one go. If you selected a non-working day (in this example, Saturday the 7th) and then hit the Make this a working day radio button, clicking OK makes that Saturday a working day. TIP: You can also use this alert to MOVE a task to the next working day (by selecting any task and hitting the radio button named the same). 4 ) Click OK, and you’re done. For these common cases of calendaring adjustments, you can simply use Options / Schedule to change the default work week, or just click on a Start/Finish date (from any view) to make changes to a particular day. This technique greatly simplifies tailoring your work days to the days you are actually working - or not! To start calendaring the easy way, subscribe to Project Plan 365 right away!